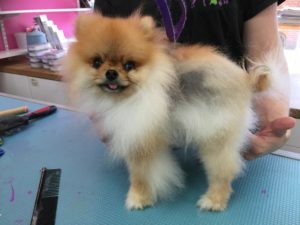 Fur bearing dogs are at risk from PCA (Post Clipping Alopecia also known as Coat Funk). The Most affected breeds are the fur bearers. Examples of fur bearing dogs are Chow Chows, Pomeranians, German Shepherds, Huskies and Golden Retrievers. These dogs have fur and not hair. They grow to a genetically pre determined length and then stop. They have a thick undercoat that needs to be brushed out regularly and they tend to drop their undercoat when it starts to get warm and when the heating goes on in our homes. If we cut in to this coat, it confuses the body’s schedule and can result in Bald Spots and colour changes. Post Clipping Alopecia.